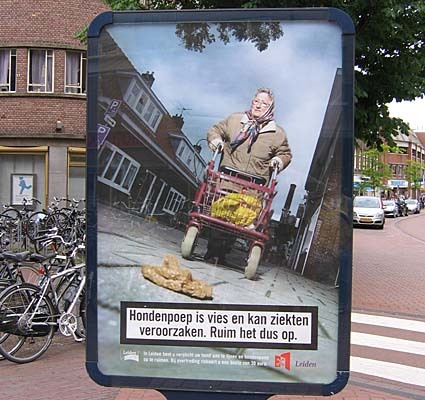 Dog poop is a big problem in the Netherlands — there are heaps all over the place. You always have to watch your step and walking on any grass in this country is like walking a minefield. Here in Leiden they have started a billboard campaign with posters that are quite explicit: one of them shows a child running after a ball that is about to roll into a fresh pile, and another shows an old lady with a steamy heap in the foreground. 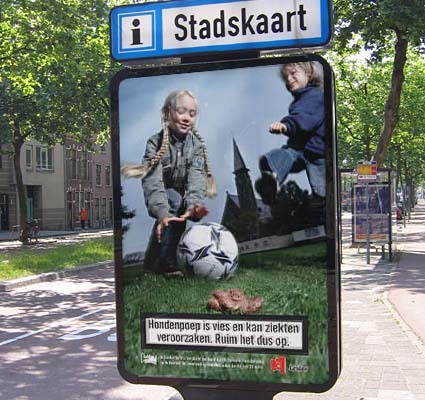 The text at the bottom (which is presented in the same way as the “smoking is deadly”-text on a cigaratte pack) reads: “Dog poop is dirty and spreads diseases, so clean it up!”. This entry was posted on Thursday, June 22nd, 2006 at 10:47 pm CET and is filed under Funny, Leiden, Life in Holland	with tags . You can follow any responses to this entry through the RSS 2.0 feed. You can leave a response, or trackback from your own site.